Congratulations to Dr. Liem Dang at Pacific Northwest National Laboratory on being named a Metallurgical Engineering Adjunct Professor at the University of Utah. In this role, Dang will advise doctoral students who are inventing, designing, and managing products and processes to transform raw materials into valuable products. Also, he will be part of one or more doctoral dissertation committees. 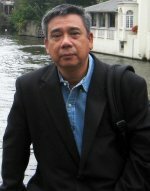 Dang was chosen for his expertise in designing and implementing computer models and simulations of molecules that have the potential to be polarized and how these molecules behave at liquid interfaces. Along with Tsun-Mei Chang, a former postdoctoral fellow at PNNL, Dang created the widely used and cited Dang-Chang model, which accurately portrays water-based systems in changing environments. Dang's work helps explain how pollutants react in the atmosphere and how toxic metals are transported across liquid interfaces. Active in the scientific community, Dang has been an Adjunct Professor of Chemical Engineering at the University of Queensland, Australia, since 2010. He is a fellow in the American Physical Society and the American Association for the Advancement of Science. Also, he is on the Editorial Board for the Journal of Physical Chemistry A/B/C and Letters. He is looking forward to working with students and professors at the university.